The Gloucestershire warehouse is located just outside the city of Gloucester, close to the M5 motorway and just 40km from Bristol. It is conveniently situated for frozen food storage and distribution in the Oxfordshire, Worcestershire and South Midlands region. The High Bay ‘clad rack ‘ freezer facility, built originally in 2009 by ISD Solutions, is nicknamed the ‘Ice cube’ by locals has a capacity of 72,000 pallets and was the first high bay clad rack freezer in the UK. ISD also installed the cladding on the offices. The project was constructed using Isocab panels 200mm thick PUR with a Polyester 9002 grey white finish. ISD Cold Store Maintenance was tasked to clean the external main walls of the facility. The structure of the cold store height was 35m high and well weathered as can be seen from the photographs. It was also in close proximity to the main railway line which has exacerbated the weathering. On account of the extreme heights involved, ISD used a MEWP (Mobile Elevating Work Platform) to complete the project. 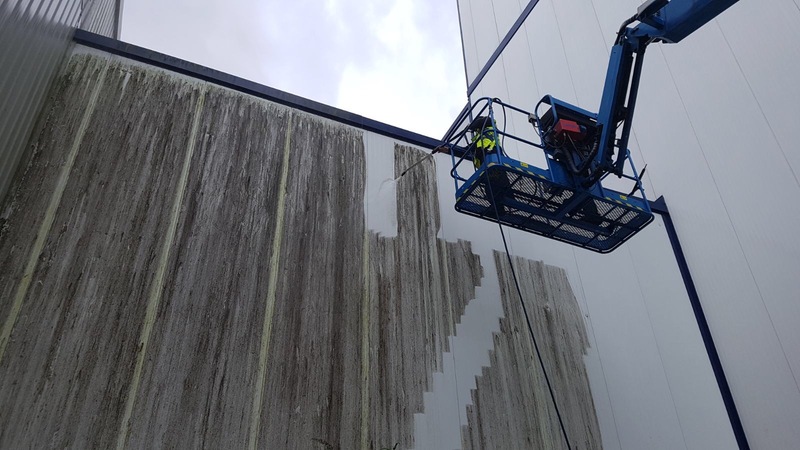 This was a very demanding and challenging cold store cleaning project given the nature of the existing building, limited access routes because of adjacent buildings belonging to 3rd parties, on top of unseasonably high winds and rain. However, ISD Cold Store Maintenance was able to meet the deadline on time and in the budget.